WJB mounted bearing units are available with sealed single-row ball bearings, a spherical outer diameter and an extended inner ring which is mounted in a pillow block or flanged housing. 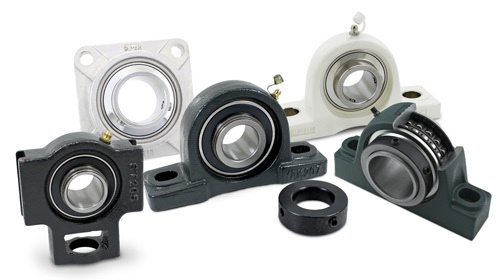 The spherical fit of the insert bearing mounted into the housing will accommodate any initial misalignment. WJB mounted units are also available with “flinger-steel shields” that keep contaminants away from the bearing seal, improve the seal performance and extend the bearing life. Housings are available in cast iron, stainless steel, thermoplastic, ductile iron, nickel plated cast iron and with a variety of shaft locking styles (set screw, eccentric locking collar, concentric locking collar, adapter, etc.). Pillow block, tapped base, 2 bolts, 3 bolts, 4 bolts flanges, etc.